XLPE is the acronym for Cross linked Poly-Ethylene. It is a form of polyethylene which has crosslinks which join the individual polymer chains together. Polythene is a material that has numerous applications in the modern world. However, it has the disadvantage of having a low melting point. This downside is eliminated by "cross-linking" the polymer chains. The cross linkings increase the melting point. XLPE has many qualities which make it extremely useful for cable insulation. It is flexible permitting smaller bending radius for the cables. It is light weight and water proof. It is also tough which minimizes the need for armouring. XLPE cables are available for a wide range of voltage ranges from 600V to 154kV. 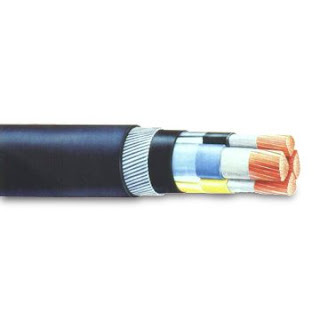 It is easier to handle and store compared to cables with paper insulation or lead insulation. They are relatively maintenance free and have simple terminating and jointing procedures. It has resistance against stress cracking.